House Shopping: Amp it Up? Do I need that 200-amp service? 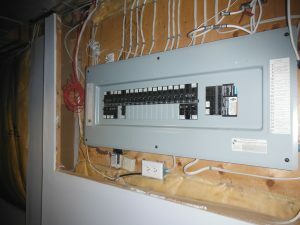 A few months ago, I inspected a small 1998 townhouse in Richmond Hill with a 200-amp service. This was way more power than needed so my “high risk” radar went up. Oversized electric services are sometimes related to a history of electric heating, either baseboard or electric furnace. Fortunately, a neighbour was involved in the inspection and could confirm that his townhouse also had 200-amp service, and he knew it had been installed by the builder. There was no history of electric heating. It’s possible that everyone in the townhouses was sold an upgrade by the builder. The picture above is of this panel in the townhouse. Not really doing any harm, but sort of a space-waster and not earning any payback on investment. I also inspected two new (2016) homes in Aurora recently, and the owners had paid the builder for an upgrade to 200-amp service. Electrical system—if you are buying an older home, find out if the electrical panel has been upgraded. If the service says 200 amps, it is an upgrade. A 60 or 100-amp panel has probably not been upgraded, and may not be enough to meet the electricity needs of your family. In GTA terms where we don’t use electric heat any more, this is a blooper. There are two things wrong with this. Firstly, 100 amps is the most common service size, and is adequate for most homes, even new homes that may be around the 3000-sq. ft. size. and most old homes that are “upgraded”. Secondly, the panel rating alone is a poor indicator of total service size and electrical wiring upgrade status in an older home. It is true that a 60-amp service is no longer considered acceptable. How do you know if you need the 200-amp upgrade? Simple answer for the new house is you don’t. You may want 200-amp but you don’t need it. If a builder is offering the house with 100-amp service, then it has already been determined that 100-amp is adequate for the house as-built along with a few extra circuit spaces for future consideration as required by code. If the house needs more than a 100-amp service based on the quantity and type of circuits, then it won’t be an option, the builder will simply install the correct size. If electrical loads are added on top of the original builder installations, then at some point the 100-amp capability may be exceeded. Typical additions that may put the 100-amp capability at risk are 240 volt ranges, driers, hot tubs, saunas. To determine when the 100-amp capability is exceeded you need an electrician to do the calculations for you. That is one reason why any significant electrical additions should be done by a qualified electrician. So, if you don’t have any plans of adding electrical load to your new castle then stick with what the builder is offering as the base model. If you are planning significant addition of electrical loads such as fully finishing the basement with a kitchen and laundry, then ask an electrician to do some calculations for you, or just lay out the $2000-$3000 for the upgrade. If you have an older home that has had many electrical additions to the original circuits provided by the builder, then you may need an electrician to review the service size to see if it is adequate. p.s interested to know what folks are paying the builder for this upgrade. The $2-3K is my best estimate now! “Nice pecs” used to be a personal compliment. Of course this was a long time ago. Back in that day, copper was used for water supply plumbing. Plastic water pipe has been used in residential construction for about twenty years now. Plastic pipe is lower cost both to purchase and install. The most common plastic pipe is called PEX. This is cross-linked polyethylene. The X stands for cross linking and this happens at the molecular level, it doesn’t describe the spider web of plastic pipe that you may find in the basement around your water heater. The cross linking of polymers results in a material that is more resistant to deformation and flow, but is less flexible. There were many growing pains along the way with the advent of plastic water pipe. There are almost too many lawsuits to keep track of for pipe or fitting failures. Complicated by geographical temperature extremes, local building practices, and local water conditions, these lawsuits that originated all over North America were not necessarily reflective of valid issues in the Canadian GTA house. 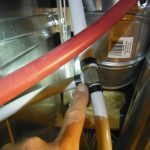 The lawsuits mostly related to leakage at fittings, and less often to actual pipe failure. Mostly the brass fittings were problematic, with an issue called dezincification. Many of the early issues have been resolved and for the past 8 years or so plastic pipe issues seemed to have calmed down. If you have “old” (about pre-2008) plastic pipe in the house it’s worth checking for any signs of leakage or oozing at fittings, especially close to the water heater. Buyers of most new homes built in Ontario are covered by the Tarion warranty system. (see Tarion.com). ProVantage Property Inspection provides warranty inspections for homeowners. This is the same detailed inspection as in the case of resale, with the report customized to align with the Tarion on-line reporting system. Each year I wonder if the builder is going to do such a good job that I can’t find enough defects for my client to justify the cost of the inspection. That hasn’t happened yet. So, I thank the builders for allowing the warranty inspection business to remain viable. The buyer of the new home is getting a better product than in years past. Now that the changes from the “2012” codes are firmly entrenched, the required attention to detail to meet basic code requirements means a better built home. The home also is more complicated, with the installation of energy saving products such as HRVs, DWHR units and hot water recirculation pumps. Sump systems have also make a come-back for different reasons in different municipalities. Builders being chronically behind schedule and allowing homeowners to move in to incomplete homes. This means that landscaping, driveways, steps and decks, and gutter and downspout systems are incomplete. Errors at exhaust installations, including missing terminals, and even complete exhaust systems missing. 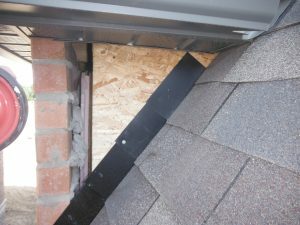 Incomplete roofing and flashing details, especially at locations that are not visible from ground level. (See photo above). Incorrect plumbing installations. This relates to some of the more complicated plumbing systems now used such as DWHR units and hot water recirculating pumps. Attic Insulation underfills and blow outs. With the R50 requirement, insulation is often about 18-20 inches deep. Underfilling attic insulation has always been an issue. I find fewer underfills now, but the deep insulation is prone to being blown around especially when light fiberglass is used. Weep hole details in brick veneer walls: Weep holes not fully open, weep holes absent where required. Missing weep holes is most prevalent at “stone-style” brick installations where the brick pattern is irregular. Poor quality materials and workmanship at sump installations, including the installation of perforated basins where not appropriate. Builders failing to explain complicated features to homeowners. By failing to educate their clients on what they are selling them, that makes the education side of my inspections beneficial. Homes are more complicated than ever. The builders’ reps are usually poorly equipped to explain the new features and related risks and maintenance requirements. Poor quality concrete work at basement floors, garage floors and foundation walls. Even though many of the concrete cracks may not be covered under warranty, highly visible cracks cause concern to homeowners and trigger customers to request warranty inspections.